Feel free to write your Council Member too! Since then I have been very aware of herbicides sprayed on city property. The other day I was stunned to see an entire lot covered with it. Recently I walked by the County Public Service Center building. In the catchment basins - that should be an example of the best water-harvesting practices - there were turquoise patches of weed killer. 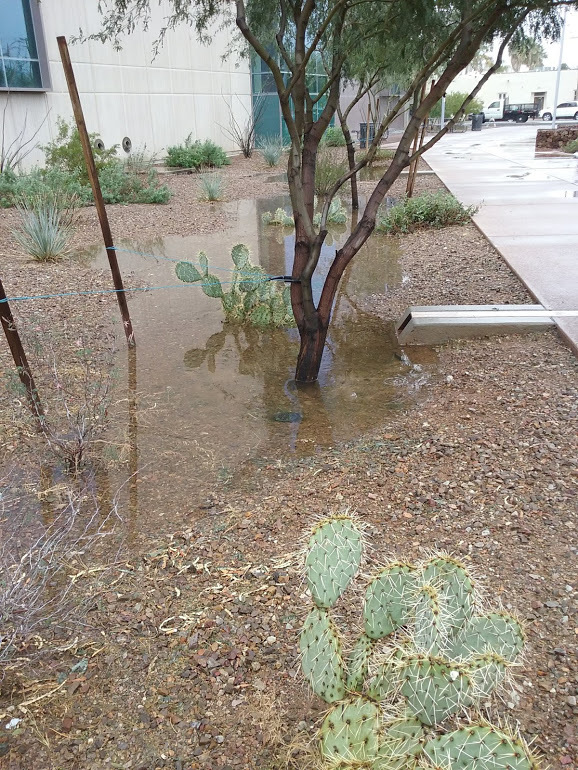 Right where the rainwater sinks in to restore our aquifer! 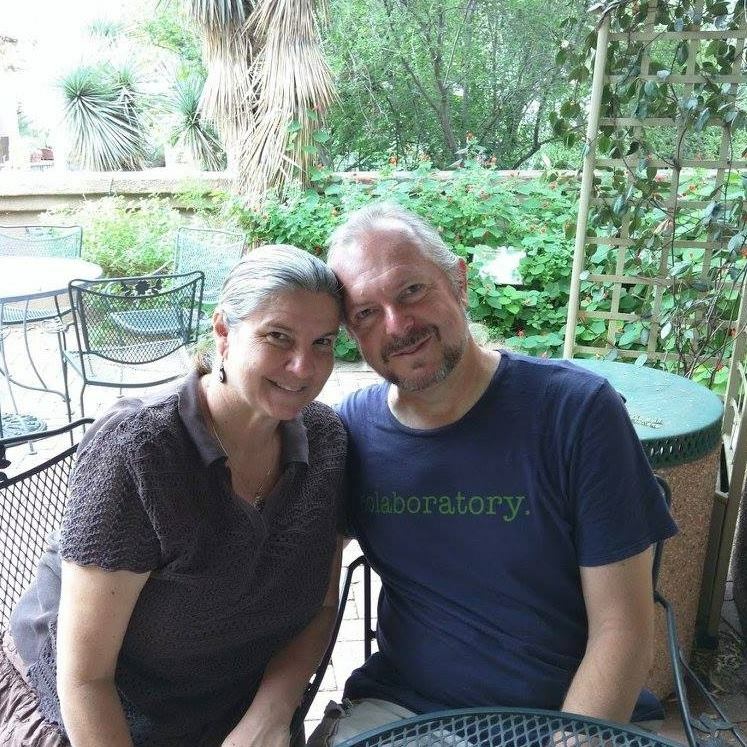 Even the Pima Department of Environmental Quality's G.I. hand books states that herbicides can sink into our ground water. I brought this up to the Pima Department of Environmental Quality just to be told that was the work of the city maintenance department. I took this picture to show bad water-harvesting instalation - a native tree planted in the deepest part of basin. 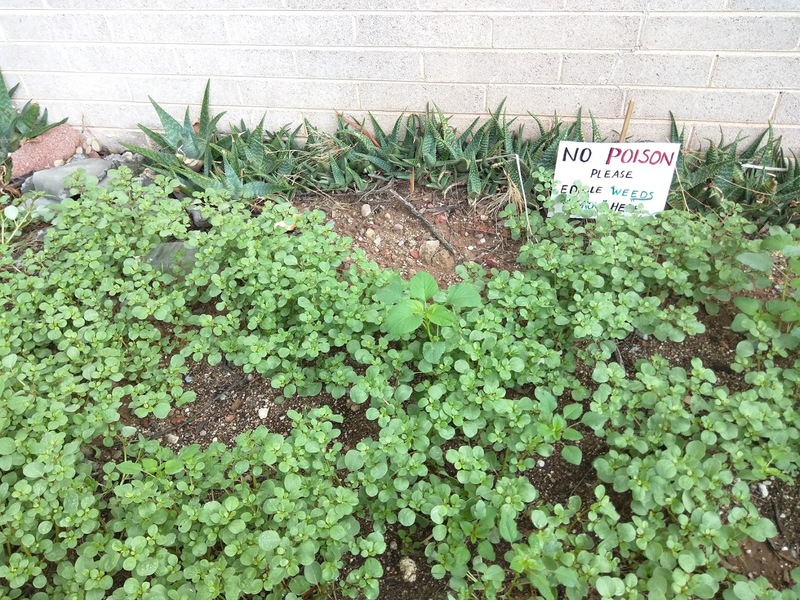 But my camera inadvertently caught the herbicide right by the drain. I am writing today because I was disturbed by a comment I heard at last night’s meeting. 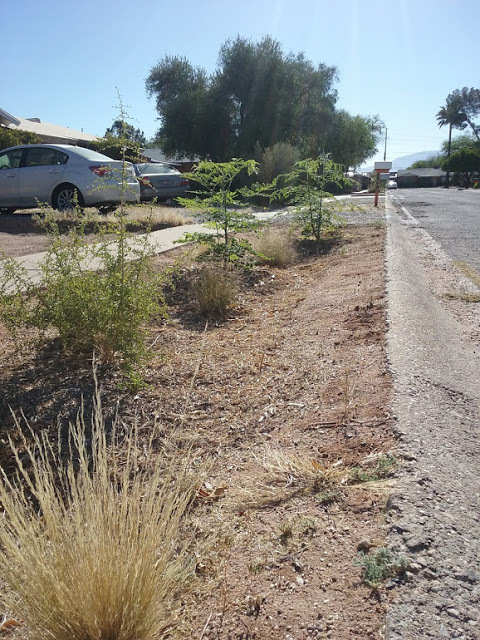 A woman from the “landscape advisory committee” suggested that monsoon season was upon us so the city should spray pre-emergent weed killer everywhere to keep the weeds from coming up. I have several problems with that. First, it won’t keep the weeds from coming up. We have used so much that the weeds have grown resistant to it, so we need more and more to kill any. Weeds will come up after the monsoon rains anyway. 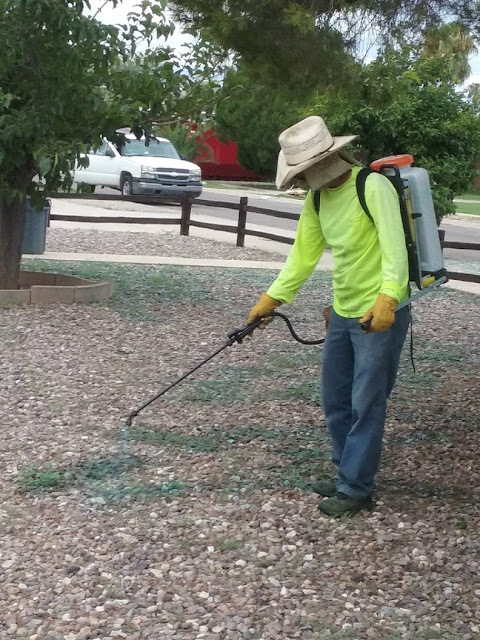 By spraying them with herbicide before the monsoon rains, the poison will just run into our yards, playgrounds and those catchment basins (that are meant to sink the water into our ground water). The post-emergent herbicide, glyphosate, has been proven to cause cancer: https://www.scientificamerican.com/article/widely-used-herbicide-linked-to-cancer/. However, there are also concerns about preemergent herbicides. It was once thought that herbicide contamination would be mitigated through filtration, but the active ingredients have been found in our ground water: https://water.usgs.gov/edu/groundwater-contaminants.html. I have done my own monitoring on the effectiveness of herbicides on weeds. Every day, I walk by that house where the landscapers insist on spraying every little weed (and sometimes the whole yard) with industrial strength Round Up. I’ve observed that the herbicide works temporarily on the tiniest weeds, but even more weeds pop up by the next month – which get sprayed too. So it’s a never ending cycle of toxic weed killers in our neighborhood. Just wait a week or so for the weeds to die in the desert sun! Herbicides have no effect on Bermuda grass (which would take a bulldozer to get out the whole root system) or the bigger weeds. We actually moved native grass into our catchment basin to help with erosion and sink in the rain. We need to rethink what we consider acceptable desert landscaping. The plastic and gravel we use to keep weeds out of the yard also keeps rainwater from sinking in to restore our ground water. 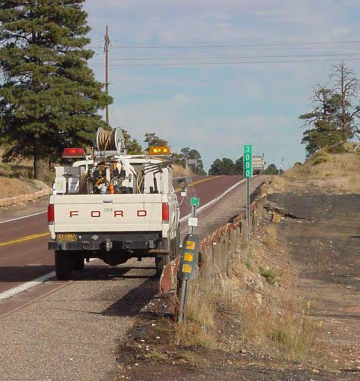 Many so-called weeds are planted in road side basins to help the water sink into the ground and prevent erosion. The native grass works with the mulch to create a sponge to soak in the monsoon rains. 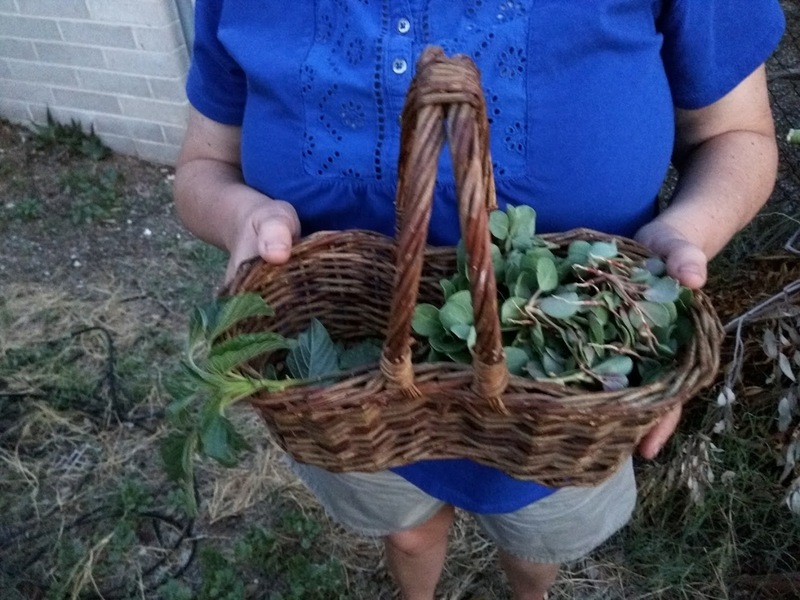 We need to reconsider what we call “weeds.” Many Tucsonans glean amaranth and purslane (in Spanish, Verdolagas), my personal favorite. I’ve heard of preschool teachers taking their students on neighborhood walks and having them taste edible weeds. 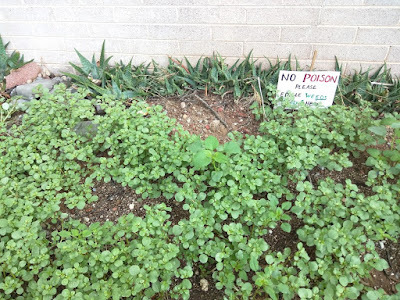 We certainly don’t want to poison children foraging at our neighborhood parks! Purslane and amaranth I harvested from our alleyway buffet. Yum! Please, look into the effect of herbicides on the public health and the cost of repeated use. Then ask the maintenance department to stop spraying that ineffective weed killer all over town. *Updated response added after e-mail to Mayor and City Council. UPDATE (April 2, 2019) Steve K wrote: "We'll see the draft on our Integrated Pest Mgmt program probably April 23rd study session. We're not banning Roundup, but what I've proposed is an inverted triangle in which the organic methods are broadly used first, and chemicals only as the last resort." I heard back from Mayor Rothschild. He forwarded my e-mail to an expert who confirmed my assessment. It was then forwarded to the Landscape advisory committee, I think. Haven't heard back from them.